Vita Coco Coconut Oil has been my dry skin saviour this winter, using it not only as my cleanser but as my night oil too.. hydration levels are on the rise! Alpha H Liquid Gold is a skin wonder, with its brightening liquorice properties and glycolic acid to remove unwanted cells without causing further dryness or irritation. Glossier Body Hero smells absolutely divine, quite similar to Tom Ford Neroli Portofino if you will ! With a iridescent smooth creamy consistency I can see this fast being my summer must have. BalmBalm Hibiscus Face Mask is a new product I stumbled across whilst looking into 100% Organic products. The stunning essential oil scent is enough to make anyone use it regularly but the deep clean feeling and tightening result will draw you in even more. Evolve Gentle Cleansing Melt was also an Organic stumble, with Baobab which is linked to the Vitamin C family and Vitamin A which is a result of the protein from baobab blended with a gentle hint of sweet Vanilla this ultra soft balm cleans my skin in one swift hit without upsetting my skins PH or irritating my eczema. Evolve Organic Hyaluronic Serum 200 has the best consistency that I have found so far, without upsetting the hyaluronic spheres this watery liquid hits the skin and is gone in seconds getting to work at hoarding water (much needed!) I use each night after cleansing before my oils. YSL BB Cream is a silky dream, I don’t like to wear make up (I’m obsessed with clear skin… obvs!) so this bad boy is an illuminating dream for a tiny bit of colour correction under my eyes and a hint of a tint … I’m good to go! I take it in Medium all year round, and just mix it into my day cream in the winter to lighten the tone. 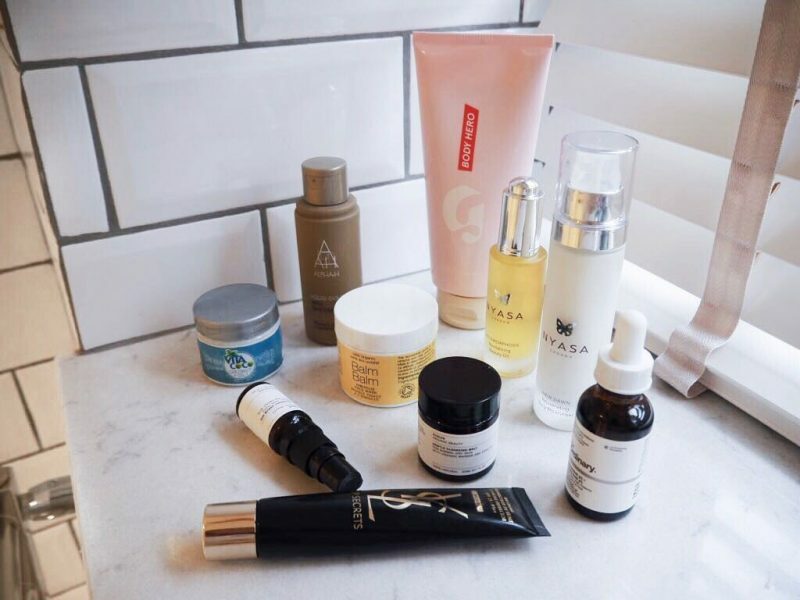 Nyasa is a high performing beauty Oil that I ADORE, the scent of Neroli, Frankincense and more glides onto my skin so beautifully enhancing cellular renewal leaving my skin dewy and fresh while plumping and nourishing. I alternate this with coconut oil before bed and then I mix a drop into YSL BB cream in the morning for an extra boost. Nyasa New Dawn Day Cream is exactly what it says it is! Gives my morning skin a new finish, it carries a rich creamy consistency for a real hydration hit with hyaluronic acid and that beautiful scent of Frankincense. The Ordinary always has a place in my skin kits which ever product it may be! This one being Resveratrol 3% + Ferulic Acid 3% which is a water free kind delivery of antioxidants.